It would have been much easier to start this new unit with a more popular novel coming from the Great War literary legacy. The so called top-of-mind World War One novels are almost worldwide the same (Ernest Hemingway, Erich Maria Remarque, Ernst Jünger, Henri Barbusse, Emilio Lussu just to mention writers from different belligerent countries). The reason why it is preferable to postpone a post dedicated to these is simple: there's already too much about their novels that can be found. Furthermore, it really makes sense to launch this new unit with the key-feeling of the Great War: fear. We usually don't pay enough attention to the simple matter of fact that fear was the most relevant and widespread feeling among the European trenches. We often dwell on strategies, battles, equipment without realizing that the simple condition of terror was by far the protagonist of that war. So simple that we don't dare to think about fear in darwinian terms, as one of the emotion of the war. 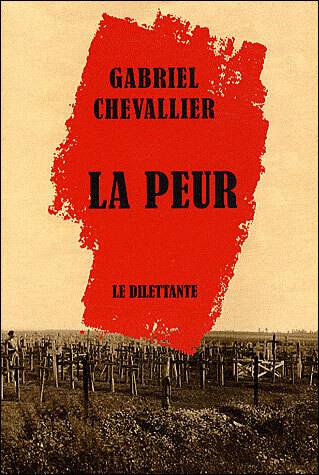 So let's start with a less popular work of fiction, a French novel coming out in 1930 with the straighforward title of La peur. Gabriel Chevallier (1895-1969) took part in war operations as a simple soldier (poilu). Now put together the year of publication and the title: wasn't it a kind of revolutionary thing to write about fear in that time, when all countries were doing all the their best to come up with narration strategies able to refund people of those heroic acts? Wasn't it desecrating to title the book "Fear" when all goverments were trying to explain that wasteful and ultimate sacrifice? Probably the best historical research is the one that proficiently joins data with fictional works (nothing better to study the so called economical Italian miracle of the Sixties than comparing facts and figures with the great fiction works of that decade). The same can be true also for World War One. If we are able to find the junction between figures and the "fictional" heritage we will get close to its core. We may find a great help in Gabriel Chevallier's book. Finally, this novel by Chevallier is a great contribution to outline another fundamental topic of the First World War, namely the relationship between the higher echelons of the armies and the fearful soldiers possessed of their resigned compliance.